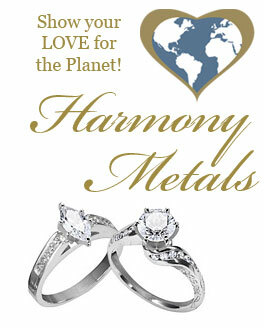 Our extensive selection of HARMONY brand engagement rings and wedding bands makes it easy to do your part in the global effort to keep our planet healthy and to create eco-friendly jewelry. So what are HARMONY diamonds? Metal mining is a "dirty" business and the production of one beautiful gold ring will generate five tons of environmental waste, contaminating water and land, which endanger the health and lives of humans and animals. All the metal used to manufacture Danforth Diamond engagement rings, wedding rings and eco-friendly jewelry is recycled and not one tablespoon of earth is displaced or tree cut down in the process. Recycled metal is exactly the same in look, value and quality as newly mined metal. Old precious metal items are melted down in an environmentally safe process and cleaned to strip away any contaminates or additives. The pure metal is once again alloyed to add hardness and brilliance and used to create a beautiful brand new piece of eco-friendly jewelry which is identical in look and value to newly mined environmentally destructive metal products. We think the use of HARMONY diamonds and metal is a no brainer and an easy way to do our part to make our planet safer for generations to come.